You are cordially invited to our monthly PhDrinks on the third Friday of this month, February 16th, from 20:30 onward. This time, we expect you at Café De Uyl van Hoogland (Nieuwstraat 28, 2312 KC Leiden). As always, the first drink is on us so look for one of the LEO board members to get your free drink voucher. Previous PostBCF Career Event 24 MAY 2018 – a complete experience for your career! 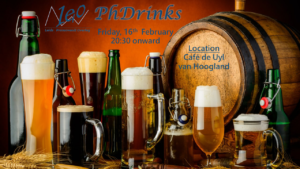 Next PostLEO LAP Party: Calling all PhD-superheroes! Buy your ticket for the LLJ Carnival party! Few seats added to the Stress Management Workshop! LEO is looking for new board members! Registration for Selfie Bingo and BBQ is open!